The annual Winter International Symposium was held on December 5–7, 2007, under the title "Asiatic Russia: Imperial Power in Regional and International Contexts." This was the last regular winter symposium funded by the 21st Century Center of Excellence Program "Making a Discipline of Slavic Eurasian Studies," and was also held as a preparatory event for the new project, "Comparative Research on Major Regional Powers in Eurasia." The study of the history of the Russian Empire and its interaction with Asian peoples has made remarkable progress since the fall of the Soviet Union. Historians have explored the rich nuances of religious and nationalities policy of tsarism, a variety of forms of interaction between the tsarist administration and local people, spatial representation and imperial geography, and other topics. This symposium was intended to summarize the recent historiography of the Russian Empire and to present a model of imperial studies from the standpoint of area studies. The symposium consisted of the following seven sessions: "Comparative Imperiology," "Russia's Expansion and the Transformation of Its Eastern Policies," "Imperial Geography and Administration in Asiatic Russia," "The Russian Empire and Muslim Networks: Competition or Collaboration?" "Russian Strategies and Intrigues in Northeast Asia," "Social Change in Central Asia under Russian Rule," and "Asiatic Russia as a Space for National and Revolutionary Movements." Twelve foreign scholars from Russia, the United States, Kazakhstan, and Germany and seven Japanese scholars presented their papers. The paper presenters included both leading specialists who have contributed to theoretical innovation in this field of study and younger scholars who study multilanguage sources. Young Scholars, held on December 5 just prior to the symposium. On December 7, we also welcomed Mr. Akylbek Kamaldinov, ambassador of Kazakhstan, to Japan, who gave a special lecture. 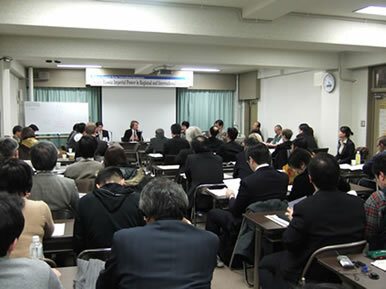 After the symposium, most of the foreign guests participated in two workshops to continue discussion: "Russian Empire: Reappraisal of the Recent Research Agenda" at Osaka University (December 9) and "Imperial Rule in Central Eurasia: Incorporation and Alienation" at Kyoto University of Foreign Studies (December 10). The series of events served as a starting point for further comparative research on empires, which we have now started in group 4 (The Collapse and Restructuring of Empires and Transformation of the World System) of the above-mentioned project on regional powers. "The Qing Empire in Its Central Eurasian Context: The Eight Banner System as a Governmental Structure"
"Between the Collapse of Japanese Empire and the Normalization of Post-war Japanese Relations with East Asian Countries: Repatriations, Reparations and External Assets Reconsidered"
Ricarda Vulpius (Ludwig Maximilian University of Munich, Germany) "The Russian Empire's Civilizing Mission in the Eighteenth Century in Comparative Perspective"
Michael Khodarkovsky (Loyola University Chicago, USA) "Rhetoric and Reality on Russia's Eurasian Frontiers"
HAMAMOTO Mami (National Institutes for the Humanities, Japan) "Tatarskaia Kargala in Russia's Eastern Policies"
Irina Erofeeva (Institute of Nomadology, Kazakhstan) "Russian Policy toward the Ruling Elites of the Kazakh Nomads from the Mid-Eighteenth to Early Nineteenth Centuries: Problems of Integration and Transformation"
Anatoly Remnev (Omsk State University, Russia/SRC) "Asiatic Russia: Colonization and 'Obrusenie' in Imperial Geography from the Nineteenth to Early Twentieth Centuries"
MATSUZATO Kimitaka (SRC) "Intra-Bureaucratic Debate around the Institution of Russian Governor- Generals in the Mid-Nineteenth Century"
Gulmira Sultangalieva (Aktobe State Pedagogical Institute, Kazakhstan / SRC) "The Russian Empire and the Intermediary Activities of Tatars in the Kazakh Steppe: Policies of Interaction and Repulsion, from the Second Half of the Eighteenth to the Early Twentieth Century"
Robert Crews (Stanford University, USA) "Russian Power and the Local Politics of Qajar Iran"
NODA Jin (Japan Society for the Promotion of Science) "Russo-Chinese Trade through Central Asia: Regulation and Reality"
Dmitry Pavlov (Moscow State Institute of Radio Engineering, Electronics and Automation, Russia/ SRC) "Secret Operations of Russia in the Far East, 1904–1905: A. I. Pavlov and His 'Shanghai Service'"
Nikolay Tsyrempilov (Institute of Mongolian, Buddhist and Tibetan Studies, SB RAS, Russia/SRC) "Open and Secret Diplomacy of the Tsarist and Soviet Russia in Tibet and the Role of Agvan Dorjiev (1912–1925)"
Sergei Abashin (Institute of Ethnology and Anthropology, RAS, Russia) "Empire and Demography in Turkestan: Population and the Politics of Calculation"
Virginia Martin (University of Wisconsin-Madison, USA) "Kazakh Chinggisids and Their Lands in the 19th Century: A Case Study of Syrymbet"
KIMURA Satoru (University of Tokyo, Japan) "Sunni-Shi'i Relations in Bukhara under the Russian Protectorate: With a Focus on the Local Ulama's Perceptions"
James Meyer (Harriman Institute, Columbia University, USA) "Public Lives and Personal Connections: Muslim Intellectuals after 1905"
Salavat Iskhakov (Institute of Russian History, RAS, Russia) "Political Activity of Muslims in Russian Turkestan in 1905–1916"
Uyama Tomohiko (SRC) "The Alash Orda between Siberia, the Urals, and Turkistan: Imperial Legacy Surrounding the Kazakh National Movement"